This picture is from Tom Wiselogel. This picture was taken right after the DCI World Championship Finals in Madison, Wis., of the fabulous Blue Knights euphonium line. My son, Dieter Wiselogel (Troopers 2003-2004 baritone, 2005 contra, Blue Knights 2006 euphonium), is the "snarly" one third in from the right. What a night that was. 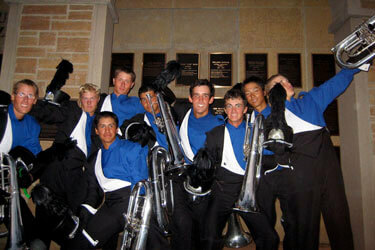 All season the Blue Knights, Carolina Crown and Boston Crusaders battled it out for the seventh, eight and ninth spot. When the announcer got to number 8 and said Carolina Crown, I swear I could hear a faint roar coming from all the Blue Knights fans back home in the Rockies. Congratulations Blue Knights.